Outplaying EBR 90 in a medium 1 vs 1 on malinovka . 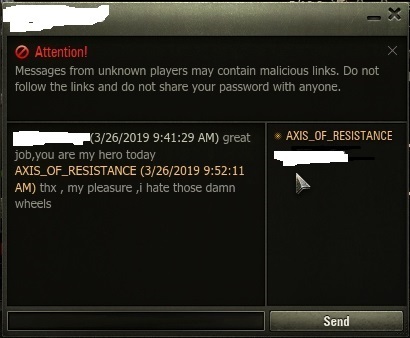 1 vs 1 on Malinovka against ebr90 , got circled to death ,my Travers\turret rotation speed were too slow to catch up with ebr90 , but he was doing counterclockwise circles , and i out played him by swiftly going clockwise and shot him ,beautiful outplay . watch it in the last 30 seconds of replay . Edited by AXIS_OF_RESISTANCE, 27 March 2019 - 03:11 PM. European Community → English Speaking Community → Forum → Game Discussion → Gameplay → Poll Did wheeled whicles ruined WoT? European Community → English Speaking Community → Forum → Game Discussion → Gameplay → Am I missing something or are wheeled vehicles a complete disaster?